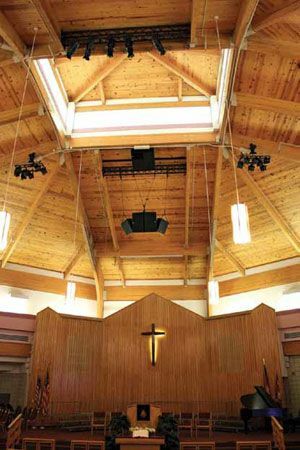 From a custom-designed truss on the wooden ceiling, two Danley SM-96 full-range loudspeakers rotated 90-degrees provide 120-degrees of horizontal coverage. A pair of Danley SM-60Fs provide side fill from the same location. CLEARWATER, FL—The Salvation Army is consistently ranked as one of the most popular philanthropic groups in the United States. Its name conjures images of Christmastime bell-ringers and thrift stores, both of which provide support for the Army’s vast network of social support programs and its comprehensive disaster relief aid. It is perhaps ironic that despite its very public alignment as a Christian organization, the Salvation Army is not well known for its church services. Its Clearwater, FL church has grown over the decades, in its congregation and its physical space, as a result of local “adherents” joining and officers from around the country retiring to its Floridian splendor. After moving to a beautiful new building in 1990 with sanctuary capacity for 385 and overflow capacity for over 300 more, the congregants suffered with a woefully inadequate sound system. Paul Garner of Florida-based CSI : Christian Sound Installations recently replaced it with Danley Sound Labs full-range loudspeakers, subwoofers, monitors, and processing, giving the church the intelligibility it had so lacked and ringing in a new era of engaging services for senior church members and the next generation alike. Because the church officials had not heard of Danley Sound Labs, Garner brought in a pair of Danley SM-60F molded loudspeakers on poles and set them up on stage. The head of the church, Captain Zach Bell, walked around with a microphone and quickly determined that the pair of Danley loudspeakers on poles was already outperforming the existing system. “I told him, ‘Wait until we engineer it correctly so that the energy is focused on the congregation and not the walls,’” Garner said. The permanent system adds little complication to the simplicity of the demo. From a custom-designed truss on the wooden ceiling, Garner tightly packed two Danley SM-96 full-range loudspeakers rotated 90-degrees so as to provide 120-degrees of horizontal coverage. A pair of Danley SM-60Fs provide side fill from the same location. For the rest of the loudspeakers, Garner repurposed the church’s rack of Crown power amps, and an analog Midas console still provides the FOH engineer with a familiar interface. But backing the new loudspeakers and subwoofer is a new Danley DSLP48 signal processor that Garner pressed to its fullest extent. The unit has four inputs and eight outputs, and only two inputs and three outputs were needed for the main system. He used several of the additional outputs to feed the existing systems in the overflow rooms, lobby, and cry room. “We used the Danley processor to equalize and time align all of those spaces,” said Garner. “Now, when the sanctuary doors are open and you walk into the lobby, you hear just one coherent sound. It all hangs together nicely.” Because the Danley DSLP48 easily connects to a laptop for programming, Garner was able to start tuning the system from a rough template that he had created off-site. The church is so happy with the performance of the Danley boxes that when the onstage musicians requested a similar upgrade, they approached Garner and asked if Danley made monitors as well. Garner obliged, installing a Danley SH -100M monitor on each side of the stage.